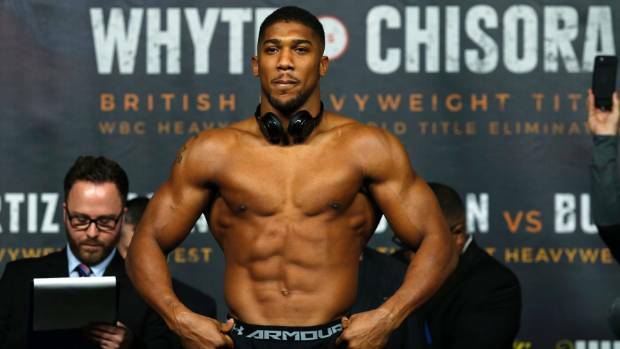 Deontay Wilder, World Boxing Council (WBC) Heavy Weight Champion, on Thursday, offered Nigerian-born British World Heavyweight Boxing Champion, Anthony Joshua, a whopping 50 million dollars (about N18 billion) for a unification fight. The hugely anticipated fight would determine who becomes the undisputed heavyweight champion of the world. The proposed bout is expected to hold between September and December at a venue of Wilder’s choice. Joshua, 28, is the new International Boxing Federation (IBF), World Boxing Association (WBA), International Boxing Organisation (IBO) and World Boxing Organisation (WBO) title holder. He recently defeated Joseph Parker by unanimous decision to remain unbeaten in 21 bouts and add the IBF title to his illustrious boxing career. Wilder, 32 who defeated Luis Ortiz in his last bout in March revealed in a video posted on Twitter that he expects Joshua to be a man of his words by accepting the offer. “All the money is in the bag so I expect you will be a man of your word,” Wilder said in a video he posted on his Twitter handle in response to Joshua claiming he would accept a bout with the American for 50 million dollars. “Tell Eddie Hearn to let you personally check his email this time. By the way, I sent your manager Rob McCracken the email as well. “I’m looking forward to our meeting in the ring,” Wilder twitted. Meanwhile, Wilder’s manager Shelly Finkel also confirmed to ESPN that an offer had been made to Joshua. Finkel added that the offer includes no rematch clause and that it would be the next fight for each boxer, taking place between September and December at a venue of Wilder’s choice. Joshua may not accept this so-call offer. Very condescending indeed. If the fight do not take place in London, then there will no fight, believe me.